Dishy News - A Transferware Blog: WHEN IS A SAUCER A CUP? A saucer is never a cup. However, I heard that people often poured their tea or coffee into a saucer and drank from it. 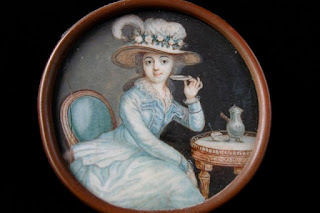 It all sounded apocryphal until I purchased an early 19th century miniature portrait on ivory of a woman drinking from a saucer! The 19th century saucers shown here are quite bowl-like. It would be difficult to drink from a modern saucer as they are too shallow. Notice that the saucers have no cup ring. When I first saw an 1820s saucer without its cup, I assumed it was a bowl. The three saucers seen above. Notice that there is no cup ring. While the habit of drinking out of the saucer seemed to disappear in England by the end of the 1850s (at least among the upper and middle classes), the custom continued in Europe into the 20th century. The French still have their morning coffee out of a bowl! That reminds me of my servant who in hurry, pour milk for breakfast in a saucer. I used to scold him very much. Thank you for your blog post. It was brief yet interesting. I remember my Grandfather pouring tea from his cup into his saucer to cool, and then drinking from the saucer. This was 1950 ish. I was scolded by my Mother for doing so, and was told the habit was "bad manners". But I have a feeling it was in my Grandad's genes!! Thanks for letting me know you like my blog! It is so much fun learning from transferware. I have several of these and always wondered about those. What about the little bowl that is with each saucer. What was it used for? The little bowl with each saucer is the actual cup. Some cups came with handles and others without (in the Chinese tradition). Don't forget about the Cup Plates. Once the cup was emptied into the saucer (bowl) to cool down and drink out of it, the cup was set on the Cup Plate to prevent tea from staining the table cloth or furniture. I love cup plates. See what I wrote about them in 2014. They are useful and don't take up much storage! I remember quite clearly that elderly people in 1950’s Scotland would drink their tea out of the saucer, having first blown on it to cool it. My mother made it clear my brother and I were not to comment, or do it. Made me laugh! My mother said things like this to me too.